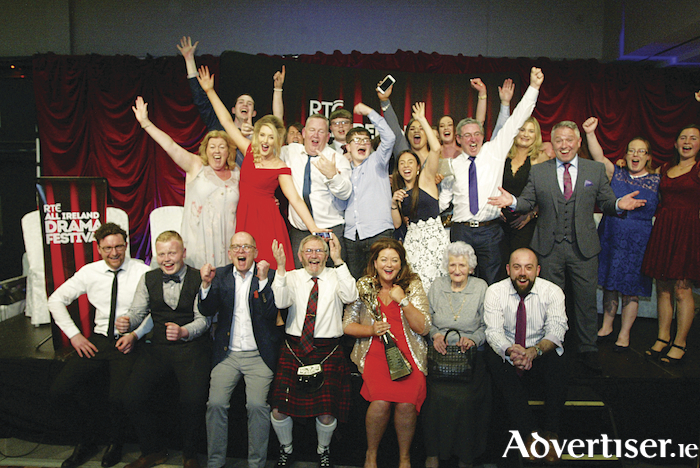 The Prosperous Dramatic Society from Kildare were crowned RTÉ All Ireland Drama champions at the gala awards ceremony in the Radisson Blu Hotel on Saturday, May 12. Directed by Lurlene Duggan, who won the Best Director Award, the group took the trophy for their play Sylvia by A R Gurney at the 66th anniversary of the RTÉ All Ireland Drama Festival. Sylvia is a playful, quirky comedy about relationships that tells the story of an exuberant, sweet dog who changes the lives of a middle-aged couple who have entered their 'empty nest' period in life. Sylvia enters into the middle of their relationship, challenging everything and everyone. Ashleigh O’Neil of Prosperous Dramatic Society gave a tour de force performance as Sylvia, the lovable puppy, and won the award for best actress on the night. Robert Massey won best actor, Paul Kelly won the award for best stage setting, and Lurlene Duggan won the Best Director Award overall. The adjudicator, Anna Walker, believed Prosperous' performance to be unforgettable, and said: “We had a night of magic and mayhem provided by the director and the group who are at the very top of their game. "The group have been performing on the circuit for many years during which they won the One Act Open All Ireland finals and the Abbey Theatre Award for their performance of The Play about the Baby. It was an evening of celebration in Athlone in a week that saw thousands flock to the Midlands where the very best of amateur drama was on display in the Dean Crowe Theatre & Arts Centre. Speaking before the awards presentation, festival director Joe Mac Carrick remarked on the success of the festival, with nine superb productions on stage, a lively and entertaining Festival Club, and an expanding and diverse fringe and town. “It is vital for the growth and development of amateur drama that the work of the movement across the country gets as much national exposure as possible. Amateur drama is part of the heartbeat of the community and we will continue to work with our partners in RTÉ, the Abbey and Westmeath County Council as we explore new initiatives to meet our mutual objectives," Mr Mac Carrick said. Mr Mac Carrick thanked the Abbey Theatre for their support and their generous invitation to Prosperous Dramatic Society to perform on the Peacock stage from Thursday to Saturday, June 7 to June 9.